Ella Rhodes reports on a community project and art/science collaboration. Rates of autism among the Somali community have been shown in several studies to be high, yet in the Somali language no word for the condition exists. People in this community with children who have been diagnosed with autism therefore encounter stigma, fear and a general lack of awareness of the condition. Indeed, Nura Aabe faced such a great deal of stigma after her son Zak was diagnosed with autism that she had to change her own social group entirely just to openly love her own son. Aabe wanted to ensure no other British Somali family would go through the same experiences as her. 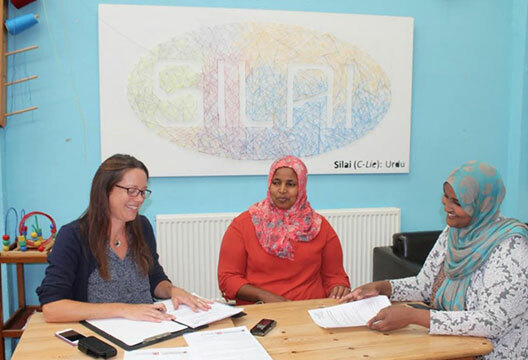 In 2013 Aabe, now an Educational Psychology MSc graduate (University of Bristol), set up Autism Independence in Bristol to provide a support network for parents, particularly those in the British Somali community, to help them to cope with and understand the condition. After a degree in Early Childhood Studies and hearing anecdotal accounts of the stigma around autism among Somali parents in the city, she wanted concrete evidence of the challenges and barriers many face, not only in accessing NHS services but also in having good support networks from close family and friends. Aabe heard of the work of Consultant Psychiatrist Dr Dheeraj Rai, which examined rates of autism among Somali people living in Sweden. Rai in turn put her in touch with the National Institute for Health Research Collaborations for Leadership in Applied Health Research and Care (NIHR CLAHRC) West. This is one of 13 UK research groups funded by NIHR that works with partner organsations to consider the needs of patients and how research can be applied to practice in the NHS. Dr Fiona Fox was assigned to the project and worked alongside Aabe to conduct in-depth interviews with 15 Somali parents about their experiences. Fox, who has a background in Health Psychology, now works for CLAHRC West’s Ethnography Team as a qualitative researcher. The research, Fox said, aimed to be truly community led and she and colleagues spent time working with community groups to explain the project and ask what they might want from the research and what could be useful. After speaking to 15 parents Fox and Aabe found they sometimes struggled to accept their child’s diagnosis, and some were confused by the diagnosis itself – particularly the fact it lacks any physical manifestation. As Aabe felt herself, parents also felt the need to hide their child due to the stigma around mental health issues in the community; some also delayed seeking any support. Parents spoke of being told their child would ‘grow out’ of autism and that they needn’t seek help from doctors. When parents did access services, they often felt shocked or disbelieving upon hearing a diagnosis – they pointed to a lack of information about the condition written in Somali, and those with fluent English still struggled with much of the terminology used in meetings or publications about it. Many families spoke of their desire for places in the community where they could safely take their child to play – they felt this could encourage people not to hide, but to socialise with their children and at the same time raise awareness in the community. Around the same time Aabe and her colleagues began their research Aabe decided to contact Acta, a theatre group which aims to create plays based on communities with unheard voices. ‘We’re not a community that uses lots of leaflets or computers or modern technology and I wanted to create something that would have more meaning to Somali families. I want people to talk about autism: there’s no concept of autism in Somali culture but it’s my son’s story.’ The first version of Yusuf Can’t Talk was created and performed by Aabe with other Somali mothers in UK and Rotterdam. She has now taken a one-woman version of the show to London and Cardiff, and plans to visit San Francisco this year. Thanks to the parallels between the production and research Fox and Aabe have developed a presentation of their work, with colleagues, that incorporates both of these elements, using clips from the play to bring to life the stories of the parents involved. Fox and Aabe recently presented their findings at the Houses of Parliament to the All Party Parliamentary Group on Autism (APPGA) and Aabe has appeared in local and national media, including BBC Radio Four’s Woman’s Hour.